When Louis Pinson retired in 1983, his great grand-daughter, Charlène, along with her father, Laurent and her uncle Christophe took over the estate. 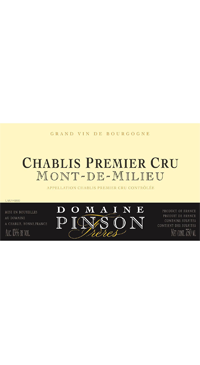 Their family roots go deep in Chablis; there is even a Pinson street. Everything is hand-harvested, with sorting of the grapes both in the vineyard and at the winery. Fermentation is mostly in stainless steel using selected yeasts, then the wines are transferred to barrel for the maturation process. The barrels for Les Clos are one to two years old, for the premiers crus three to six years. The straight Chablis stays in stainless steel.